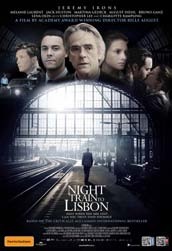 This week, BEN and Pinnacle Films are giving five lucky winners the chance to win a double pass to the new movie, Night Train to Lisbon, due for release on 5th December. After a chance encounter with a Portuguese woman, Swiss professor Raimund Gregorius quits his job and embarks on an adventure to Lisbon that will take him on a journey to the very heart of himself. Check out the trailer here: www.youtube.com/ watch?v=9Ds5L7qS85s. What country is Jeremy Irons’ character from? What country is Lisbon in? Name another film Jeremy Irons has starred in?